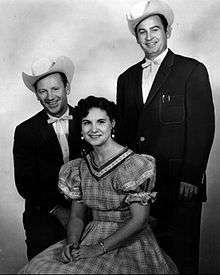 Johnnie & Jack were an American country music duo composed of Johnnie Wright (1914–2011) and Jack Anglin (1916–1963). The duo became members of the Grand Ole Opry in the 1940s. Between 1951 and 1962, the duo released several singles on the RCA Victor Records label, including their version of "Goodnite, Sweetheart, Goodnite" which peaked at No. 4 on the Best Seller charts, and the No. 1 "(Oh Baby Mine) I Get So Lonely". Whitburn, Joel (2008). Hot Country Songs 1944 to 2008. Record Research, Inc. pp. 210–211. ISBN 0-89820-177-2. ↑ "Opry Timeline - 1940s". Retrieved July 10, 2012. ↑ Whitburn, Joel (2004). The Billboard Book Of Top 40 Country Hits: 1944-2006, Second edition. Record Research. p. 177.